Modern dinnerware in classic white porcelain. EXCLUSIVE Simple and stylish, our white egg cup is an elegant way to serve soft- or hard-boiled eggs and complements any décor. Down-to-earth modern, our versatile whiteware collections are perfect for both entertaining and everyday use and are only available at Sur La Table. I have looked for these Egg cups in many places, since I have been used to eat my soft boiled eggs in them as a kid. I finally to my surprise, when I even was looking for them, found them at Sur la Table. I am so very happy. Love them. Beautiful and functional addition to my table. Lovely elegant cup to serve eggs. Easily hold an extra large egg. Very practicall and easy to holl the eggs. Good price point. Classic white and form. I like poached eggs and have no container currently. It is a gift for parents who eat a lot of soft boiled eggs and do not have egg cups. They are beautiful, practical egg cups that go with any dinnerware option. I grew up traditional having this at are breakfast table! To compliment the egg topper. 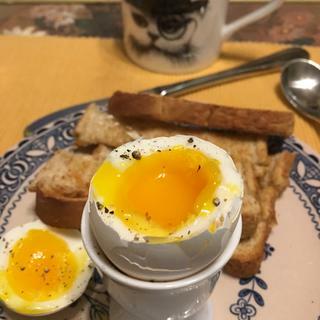 we've been making more soft boiled eggs lately, and an egg cup makes sense since I don't have to cool down the egg to where it gets cold in order to handle it comfortably to eat it.